Contents: Sardines, milk, rice, orange slice, not sure what is in the bowl. Any ideas? The stuff in the bowl looks like nikujaga. It`s a Japanese stew of beef, potatoes and carrots. 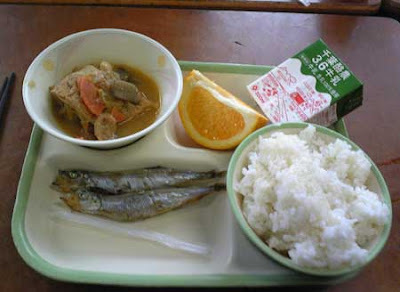 It`s a common school lunch dish. I am amazed that Japanese school kids have no problem eating a whole sardine. Totally different world. They'd probably be grossed out by our spaghetti and meatballs. Not really. Japanese school lunches serve spaghetti too. And spaghetti is a popular dish in restaurants all over Japan. I will admit though that while ground meat sauces are popular I have yet to see an actual meatball. OMG! How can they eat this? Yeah, really totally different world. I can't stand eating fish at all. And I hate rise. And it doesn't really include enough proteins for young boys and ladies. Fish doesn't have enough protein? Uh. There's a reason why Japanese people have been known to live the longest -- their staples of fish and rice. Do people in Japan have to bring their own lunches or does the school provide them for them? Depends on the school. If the school doesn't have a kitchen, and they can't get delivery lunch, then students bring bento (lunchboxes.) Google "お弁当" for some lunchbox insanity. Fish is never that popular in the West. I have a Japanese friend and she seem to be pretty flexible. She can eat rice and dish or just grab a pizza. And, the amazing part is, she stays fit. Is that because Asians have slim bone structure or it is because of the food they eat? Plus, she can really perform well in class. Quite a simple dish but healthy enough. It is such a typical japanese dish. This type of dish makes me feel hungry!!! This is looking a great dish.Specially that lemon part is making its appearance awesome.